The NLV2101 is a high performance 2D scanner with low power consumption. The metal case is water-resistant and dust proof. The NLV2101 guarantees an IP rate of 67. High performance LED’s create a sharper contrast between the code and the background for faster reading and decoding by the 1.3 megapixel imager. The embedded feature of scanning barcodes twice reduces discrepancies and ensures data accuracy even if the code is oriented in reverse. 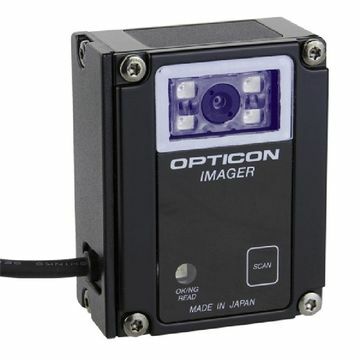 This compact and rugged fixed mount device uses Opticon's proprietary scan engine technology for quick and accurate results. In addition to the standard software and manual trigger options, the NLV2101 is equipped with an auto-trigger function. In order to optimize flexibility, the NLV2101 is equipped with mounting holes located on two sides of the housing to maximize mounting options. The availability of several interfaces (RS232, USB HID/VCP) enables easy connectivity.